Celebrating over 135 years of quality, Catholic education. Sacred Heart School and the parish was established in 1882. The church opened its doors in March 1882 and the school began its first scholastic year in October 1882. School was conducted on the first floor of the original church building, which served as a church, school, and convent. Seventy-eight pupils were enrolled that first year and were taught in two classrooms by four Sisters of the Society of the Precious Blood. Grades one through four studied in one room while grades four through eight occupied the other classroom. 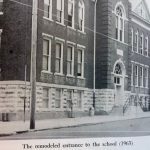 For twenty-five years the children of the parish went to school in that building and each year enrollment grew steadily, until 1906 when enrollment had reached 162 – too many for the small school. The land across the street was purchased from Martha Smith and Sarah E. Cotton for the price of $2,000 and a new school was erected, for a cost of $20,000. The NEW school opened in the fall of 1907. Besides classrooms, the basement of the new school had a kitchen, shower and restroom, club rooms, and one bowling alley. The second floor also housed a parlor, a parish hall, and a smoking room. Eventually, as enrollment grew over the years, some of these rooms were converted to classrooms and storage space. In 1928, a small parcel of land to the east of the school was purchased to add a playground. Then, the Great Depression struck, and for the next thirteen years, nothing of note was done to improve the school grounds. A major step was taken in 1941 with the establishment of the parish high school. (This was not the first Catholic high school in Sedalia. The Sisters of St. Joseph had conducted a private academy for girls at St. Patrick’s Parish from 1890 to 1905.) 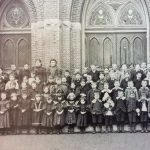 There had been talk for nearly twenty years of parent’s concern for their children’s Catholic instruction and schooling past the eighth grade. The plans were for a high school building separate from the grade school. 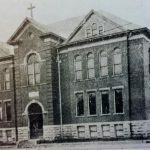 But when word came from Bishop O’Hara of Kansas City that the high school needed to be established immediately, there was no other choice but to combine the high school and grade school in the same building for lack of sufficient time to build a new high school. When the high school opened in September 1941, Sister Rosetta was sent to teach the twenty-seven students who were enrolled in the first freshman class. Each year subsequently, another class was added, until in 1944, there was a fully functioning high school. 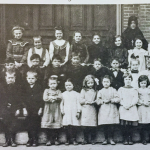 In the mid-1940s, lay teachers were first employed to teach in the school because the growing enrollment surpassed the supply of Sisters available to teach. At the start of the 1967 school year, the school employed twelve Sisters and ten lay teachers to staff both the grade school and high school. Building space was an issue for the next several years as the school enrollment continued to grow. In 1948, another expansion came with the addition of a gymnasium, and in 1956 the classrooms and cafeteria to the east of the original building were added. It was said that the beautiful, new cafeteria was “the envy of the whole of Sedalia.” In 1963, the total enrollment was as high as 658 which was maximum capacity for space. The late 1960s proved to hold steady high enrollment with grade school students on the waiting list sometimes.